Living a normal life unhindered by an MTHFR deficiency is very attainable and prevention is definitely the best course of action. Making the changes recommended in this article are important so you can optimize your folate levels and minimize the effects that the environment may have on the expression of the gene. Remember that you are born with the genes you have but it’s really the environment that causes the expression of genes. Processed foods today contain many chemicals that can be harmful to our biochemistry. All the preservatives and synthetic additives create a strain on an already laboured detoxification system. Some processed foods may also be fortified with folic acid, the synthetic form of folate (B9). This should be avoided completely as it can build-up in the body and inhibit an important gene DHFR that is crucial for your folate pathway. Whole unprocessed and preferably organic foods and leafy green vegetables should be paramount in optimizing folate levels if you have an MTHFR gene mutation. Natural sources of folate are the best means of increasing folate in the body, especially if one is not able to take a folate supplement such as methyl-folate. Incorporating dark leafy green vegetables such as kale, spinach, broccoli, and legumes into the diet provides not only the required folate but also the added benefit of fibre which aids detoxification and various vitamins and minerals that support MTHFR conditions. Certain antacid medication that treats acid reflux and heartburn such as Nexium are not advised for those with MTHFR polymorphisms. These medications act as proton pump inhibitors which block the absorption of vitamin B12. This is bad for those with MTHFR due to their high demand for vitamin B12, and any inhibition of B12 intake will create a knock-on effect on all other B vitamin utilization. Essentially you will not utilize your methylfolate optimally if your B12 is low. Some antacids are also capable of reducing the body’s ability to detoxify by affecting the P450 cytochrome detoxification pathway. By determining which variation of the MTHFR polymorphism you have will provide you with vital information. This will help in determining what course of action should be taken in treating the many symptoms. 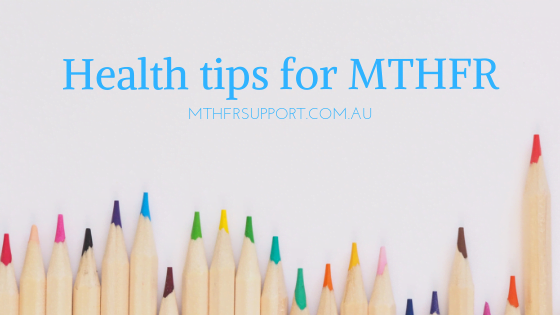 Once the MTHFR genetics are known, it is advisable to consult an MTHFR doctor who will be able to assist you in determining how and if the MTHFR mutation is affecting your health. The dental amalgams that were commonly used to fill cavities are made of a mixture of elemental mercury and other metals (not now, but many of you will have old mercury fillings in your mouth). Although it is considered to be safe, there are concerns that the elemental mercury may leach into the body through the wear of the filling over time. This is typical of many people who have MTHFR polymorphisms as we need methylation to detoxify heavy metals and so their detoxification system may not be able to remove the heavy metal quickly enough. It is then recommended to remove the amalgam and replace with ceramic fillings instead. It’s also recommended to avoid aluminium products such as cookware and antiperspirants. Making time to aid your body’s detoxification system by taking Epsom salt baths, dry skin brushing/exfoliating and spending time in an infrared sauna or steam sauna will not only flush your body of toxins, taking some of the load off your detoxification system, it will also give you some time to unwind and relax. Exercise is widely known to contribute to a healthy and balanced lifestyle. Regular exercise greatly aids in detoxification by raising the heart rate and flushing out toxins through sweating. By following these tips, you will be minimizing the effects that the reduced activity of the MTHFR enzyme may have on your system. Not only will your health improve, your quality of life will improve with it. It’s up to you to take the necessary steps to care for your body and provide it with the support it needs.